Shortly after posting the last DTC, Ep 39, Argus came through again on the computer and said “I am calling on ALL Dragons’. A few hours later an ‘energetic’ meeting took place with the following details coming through. Argus announced the Red Dragon is here and he introduced himself. The Red Dragon, Fire Dragon (with Gold under his chin) will be appearing soon. He is here to perform a cleanse, it will be a fiery cleanse. Although necessary and for our highest good it will probably be quite disruptive. 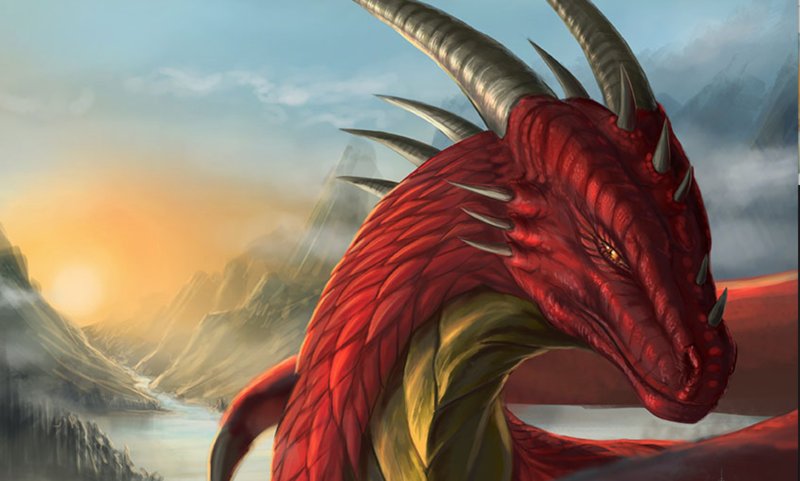 Argus is calling in ALL Dragons, including ‘Realm Keepers’ from other realms….. This cleanse will be very physical, ‘lots of heat in our bodies to accelerate the cells to vibrate at a higher rate to prepare bodies to transition’….For some this will be very uncomfortable. -Symptoms can include: internal heat/burning, head pressure, vomiting, diarrhea, cramping, high blood pressure and migraines. Recommends rest, hydration and meditation. There will be many deaths, people leaving this construct during this time. For heart sourced beings going home this is a choice. This will be the first big wave of people leaving, via heart attack, stroke and aneurysm. It won’t be reported publicly, you will hear through word of mouth and personal contacts. This energy will move ‘across the plane’ geographically over several days. Use your discernment, if it fits and helps to support or explain your own experience then great. I wrote a few days ago on fb, the dragons will be roaring with this new moon. Thanks for the heads up! It sure fits in with the Mayan wavespell we are in now. Crossing worlds with the power of death. WOW and thank you Lisa, you are confirming what I have been sensing in my body. Lots of heat and general mental unease that has been going on for about 2 weeks now. Great to know we are in the shift, EHA!! Heart Hug to all !!! Wow what a confirmation. I watched the latest DTC video yesterday when It popped up on my notifications. I loved every second of it and am grateful. As the day passed I caught myself sweating when I was indoors. I have an air conditioner in my room and it was as low as it can go as far as temperature goes. I just could not cool off. I then moved a chair and sat directly in front of it. It did nothing to cool me down. The heat was inside of me. I had a thought that it could be some sort of upgrades or something. Now this message confirms it. I had a dream years ago that I feel was showing me my connection with the red dragons. In short my left arm (from forearm down) was covered in bright red scales that flexed when i was moving it around/wiggling my fingers/rotating my wrist. It was very beautiful to look at. That dream also involved a very tall “grey” looking being in a very sparkly skin tight body suit with a small ship that was landed on my back yard. Again I am grateful for this info and am excited for the continuing changes both geopolitical and energeticall. All of my life I have had an affinity for dragons. I told my husband (who is not quite a believer, but does not come out and tell me I’m crazy, LOL) that I thought I was a Dragon in a previous life. I have no powers, no visions, can’t talk to angels nor have I ever seen an Alien or an Alien craft. I believe – but I am not able to get in contact. Do you talk to people or counsel people or whatever you want to call the things that people do these days, or do you know of someone who might be able to talk to me or do a reading if that is what you call it, for me in order to know if something is blocking me from any physical manifestations or abilities or gifts like the ones you guys have? What is the frequency of purple you were going to reveal in Episode of DTC #39? Symptoms: internal heat/burning on & off out of no where, head pressure, vomiting, diarrhea, cramping, high blood pressure, heart pulsations and migraines. Doctors were confused as what we had was not the flu and asked allot of questions about where my husband worked and where we might have contracted this bug. He works happens to work for a shipping company and a lot of people are from Laos and Thailand. While I have never cared for Dragon’s, Draco’s or the like I have periodically been shown some things about my past lives that might or might not be true. Most recently after my illness I have suddenly had an attraction to an opalescent female white dragon (Representing the 5th element of Spirit) show up. She gives me mental visions of wrapping her wings around me in a protective manner and emits love. Not sure what it means or what to believe, as I said not a fan of Lizards, never trusted them. Cyn, with all due respect, Dragons are NOT of the ‘reptilian’ agenda. They are in a league of their own and of the highest order. They are extremely loving and are here now to help us shift. The vision you had of the white Dragon is wonderful. Accept it and embrace them as family! They are the MOST wonderful Beings you could EVER want to know. I highly recommend you get a deck of Diana Cooper’s “Dragon Oracle’ cards for yourself and read about the dragon you saw in your vision (She is in this deck) and you will learn how to work with her. You are very blessed to have her protecting you. Blessed be. Thank you Arena Naheim, for taking the time to offer me this information. It is greatly appreciated and I have ordered the cards. You will not regret your decision. Enjoy!!! OMG! Please watch this video! This is your confirmation Lisa! 🙂 ‘Blood skies’! Awesome!!! I took a photo a while back of the moon and sunset clouds and when I uploaded them the clouds looked like a red dragon blowing out puffs of ‘smoke’. After that I had read several articles talking about the red dragon so I asked my pendulum, ‘higher self’, if i had a red dragon as a ‘guide’ and it said yes. I would post it or send it to you if I knew how to do it. My husband also had to go to the emergency room with heart palpitations, high blood pressure, anxiety a few weeks ago. The tests came back ok so far (still waiting on the results of the stress test) and we have had the hot and cold, shoulder/neck aches, head pressure, etc for awhile now. I have some chest pain on and off, but not as bad as his is. He’s done the meditation, tai chi, releasing, integrating, extra nutrients (like magnesium, etc.) and his symptoms still come and go. Keep watching the schumann and geomagnetics. Thanks for all the info. Amazing! So very coinkydink….I had a premonition that I would die of a stroke on April 15th….but I didn’t obviously….wonder what that was about???? LOVE and welcome the Dragons! I have the ‘Dragon oracle cards’ by Diana Cooper! This deck is exquisite!!! Highly recommend to all who are interested in working with the Dragons. I have been having dreams and day dreams of a dragon curled around me in a very protective and comfortable way for some time, and the sensation of it gives me great joy. Now since yesterday I am feeling the High blood pressure and pressure in the head and chest and I so far control it with cleansing breathing by blowing out the belly on the inhale and sucking in the belly on the exhale for a while. After I read the Red Dragon post I think I am going to quit drinking coffee and take my blood pressure meds which I haven’t had to take for a while , I really want to ride this out ! since I was 7 years old I have been awake and wanting to go home. Would it help if 100 of us arranged a time to meditate together? Did anyone ask that question of Argus? Lisa Thank you for all of your work, I look at so much info and yours is what resonates with me. Funny you mention 100, he made direct reference to that number of people coming together physically. We did the next best thing by getting together online. I don’t mean to burst anyone’s bubble, but aren’t dragons glorified snakes with wings, aka winged serpents, aka reptilians? The bible mentions dragon several times, referring metaphorically to Satan. Hello?